Call today for moving quotes! We also have a second location to serve you. bonded with each job supervised by owner Steve Lamanna. 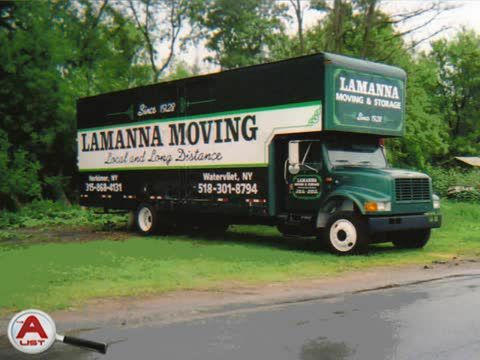 Lamanna Moving & Storage, LLC is one of the best family owned and operated professional moving companies that has been serving the Albany, NY area since 1928. We are a fully insured and bonded moving company with offices in Albany & Herkimer, New York. Our staff is professional, friendly and accommodating and all moves are supervised by the owner, Steve Lamanna. We are sensitive to your needs and know the things we move are more than just objects but your family possessions. More than just residential movers, we also take pride in our ability to disassemble large or intricate pieces, pack them safely and get them to the new destination where we will expertly reassemble and locate it just where you want it. We also offer moving quotes! We make the experience easy, stress-free and worry-free for our customers. Lamanna Moving & Storage, LLC knows these are cherished possessions, not just furniture, and with our many years of experience, we offer suggestions that will not only get your personal items moved safely but on time every time. Then we help our customers set up their new home or office and make sure everything is "just right." We are your local professional residential movers! Moving just got easier because we do it all: from safely packing, loading and shipping, to assembling and setting up even the biggest items in your home or office. We can assist with commercial or residential moves! Our state-of-the-art moving trucks, trailers and equipment allow us to be your movers for every size job, no matter how big or how small. Lamanna Moving & Storage, LLC is associated with many area apartment rental companies and our residential movers have the right equipment to move your things safely and on time. Apartment rentals or entire warehouse moves are completed with ease because of our experienced staff and know how. Ask us about the special "Snow Bird Specials" we have available or our senior citizen discount. 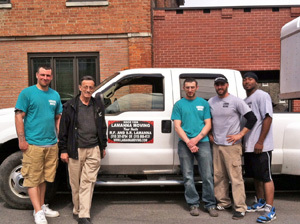 You can always count on Lamanna Moving & Storage, LLC for all of your moving needs within the entire Albany, NY area! 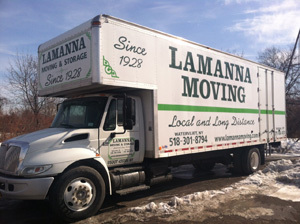 Contact Lamanna Moving & Storage, LLC if you are currently looking for moving quotes, we offer free written moving and packing quotes (518) 301-8794! Our moving companies can help with full or partial moves to Albany, from Albany or within Albany! Free written estimates and fully insured. We disassemble, safely pack, move and re-assemble even the most intricate objects no matter how big or complicated. Local and long distance moves, both commercial and residential. Full or partial moves. Full or partial packing services. Auto transport across town or across our nation. Senior Citizen Discounts and Snow Bird Specials. Professional and Friendly Service - Always!